Inspiring Oxfordshire's children to keep active during the summer holidays with activities the children could do at home. Promoting signups to the NHS Free 10 minute Shake Up activity pack. Leah took on the assignment and with the help of Ed a professional entertainer, created dance routines that would rival Butlins. We chose well known songs 'Moves Like Jagger,' Bob the Builder Big Fish Little Fish,' 'Gangham Style,' and our most popular 'Choccolatte' and choreographed simple memorable dance routines for each. 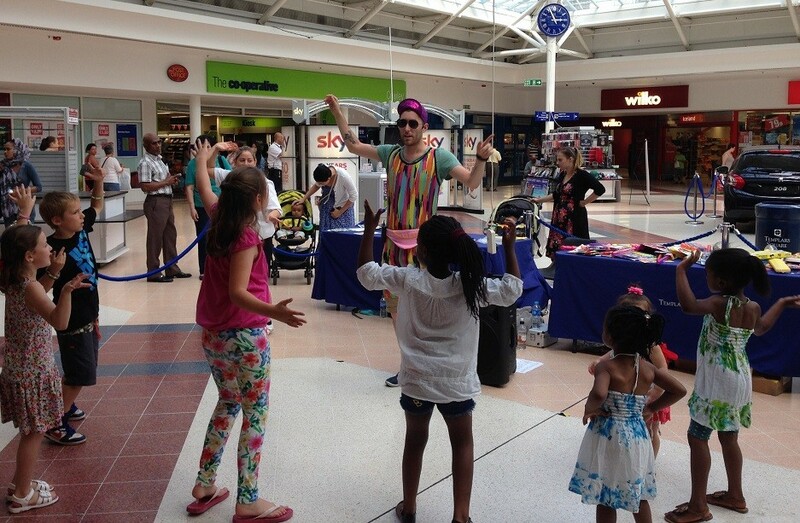 We landed, sound system and all, in high footfall areas and encouraged children to dance with us for 10 minutes. Each child received a prize which would encourage activity through play. Prizes: Goggles, Footballs, Throw & Catch Toys, Frisbees, Floats (for swimming) and beach balls to name a few. Leah and the Your Events Team are full of infectious enthusiasm for their work and always put in the maximum effort to make an event go off in style. They are a pleasure to work with because of their creativity and their flexible, can-do attitude.